I first encountered this book three years ago, in 2015. Intrigued by its sparse catalog record, which at that point consisted of a cataloger-supplied title (“[Cartoons based on quotes from Shakespeare]”), an estimated page count, and little more, I went down to the vault to retrieve it. 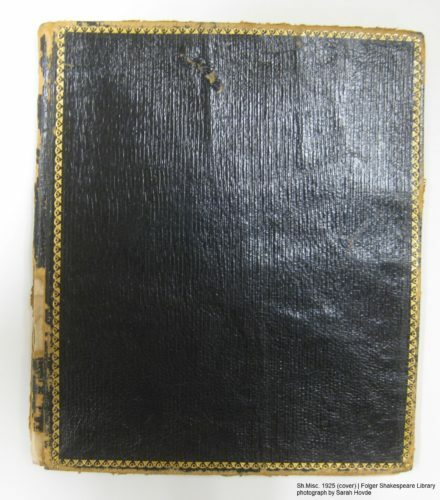 It turned out to be a little volume of, well, cartoons based on quotations from Shakespeare, interpreted in settings humorously far-removed from their original contexts; almost square, with a plain leather binding and some small gilt embellishments bordering the front cover. No title or artist on the cover, no title page, no publication information tucked away in a colophon. The only clues were a distinctive artist’s mark in several images, and a signature on the front endpapers. I looked up the monogram in multiple directories, reverse-image searched it, and threw all the keywords I could think of into Google (“j inscribed in diamond held by birds”? “cranes rhombus cartoonist j monogram”? )—no luck. Similarly, searching for the signature netted nothing. I shared images of some of the cartoons on my personal Twitter, but received no responses. Discouraged, I returned the book to the shelf but vowed to return and solve its mystery later. Last spring, I decided the time was right: I would catalog this book for once and for all. I brought it up from the vault to the cataloging office once more. I compared all its clues once more—monogram, signature, reverse image search—and once again hit a wall. This time, however, I decided to make some educated guesses. 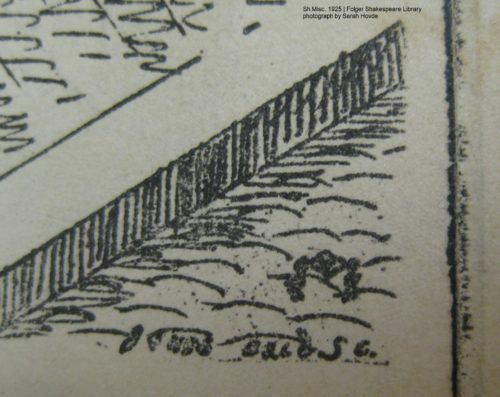 Close-up of artist’s monogram on page . The settings, situations, and personages of the cartoons seem to be consistent with urban England or America in the second half of the 19th century, as does the artistic style. I consulted with other Folger catalogers at our regular meeting, and they agreed. 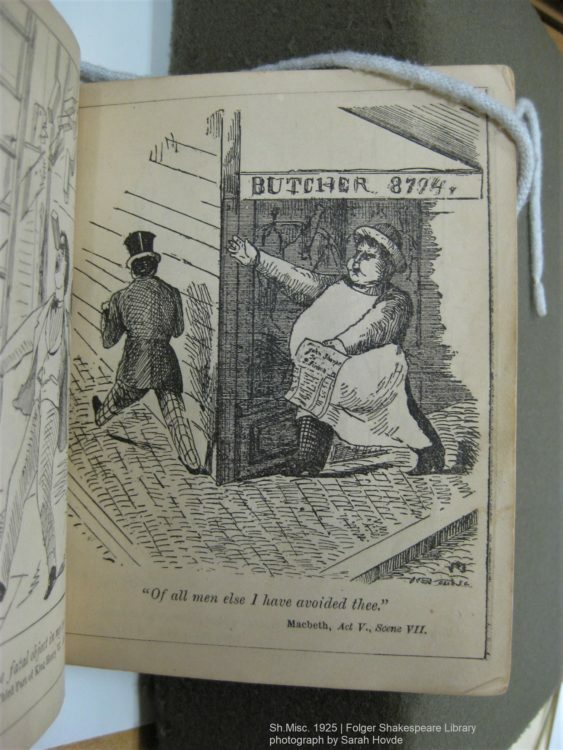 Senior cataloger Deborah J. Leslie suggested that the cartoons might have been previously published elsewhere and collected in this volume, as several of them had seemingly random borders and page numbers. One image had what appeared to be a caption: “Black Boards, 59 Bromfield Street,” further corroborating this idea. I found that there was a “59 Bromfield Street” in Boston (as well as a few other Massachusetts towns). 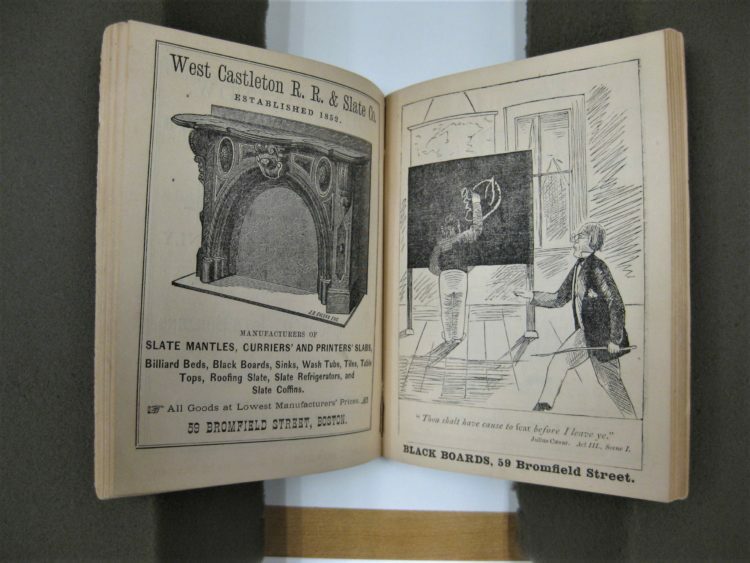 Searching in Google Books and the Internet Archive surfaced a few trade publications and local directories that listed one Joseph W. Grigg, a seller of “genuine slate blackboards” at that address in the 1870s and 1880s. Our guesses seemed to be confirmed: the cartoons were likely of late 19th-century American origin. Was this a breakthrough?? Well, maybe. It still left a number of unanswered questions: who was the artist, he or she of the “J” in a rhombus held up by birds? Was it the same person who had left their signature in the front of the book? Had the cartoons ever been published elsewhere, or was this a privately printed personal keepsake and nothing more? However, I decided, I had wrung as much information out of this strange book as I reasonably could. I cataloged it as much as possible, filling the information I had into the appropriate fields and providing my reasoning in a note, and reluctantly moved on. The book went back to the shelf, and I moved on to the next items in my queue and tried not to think any more about those Shakespearean cartoons. 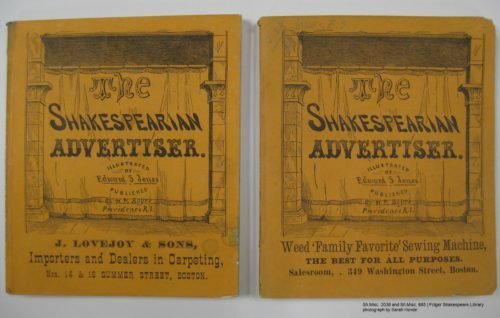 The Shakespearian advertiser: first edition (Sh.Misc. 2038) on left, second edition (Sh.Misc. 885) on right. Opening up the Advertiser, I almost felt lightheaded. There, within its pages, were those same Shakespearean cartoons that had haunted me for years! But with one very significant difference: here, they had an artist and a date. I now know that the artist is Edward S. Jones of Providence, Rhode Island, and that the cartoons were published in 1871. Jones worked as an illustrator and engraver, and one of the Advertiser editions even includes an advertisement for his services at the end. E.S. Jones, designer and engraver, Providence R.I. The Advertiser contains listings for local businesses in the Providence, Rhode Island, and Boston, Massachusetts, areas, so my guess of Boston was pretty close! 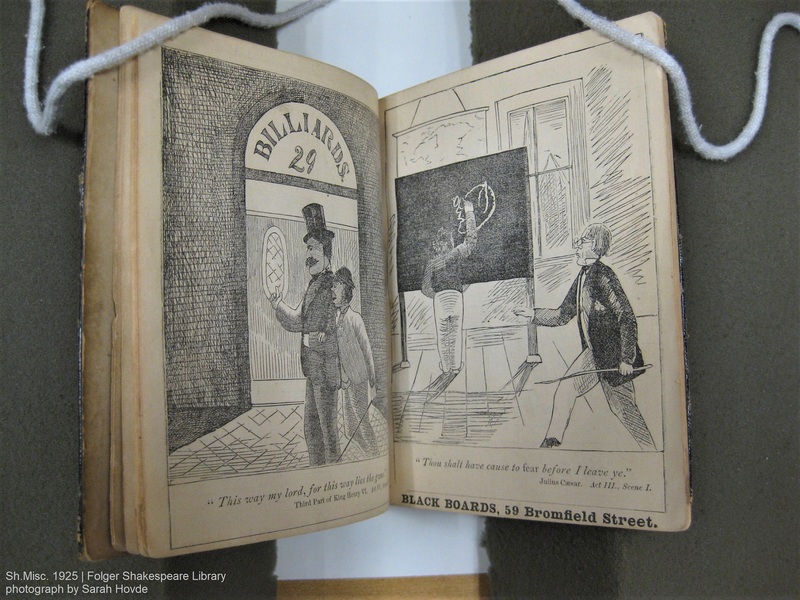 (However, it turns out that the “black boards” cartoon accompanied an advertisement not for Joseph W. Grigg, but for an earlier seller of blackboards at the same address in Boston.) 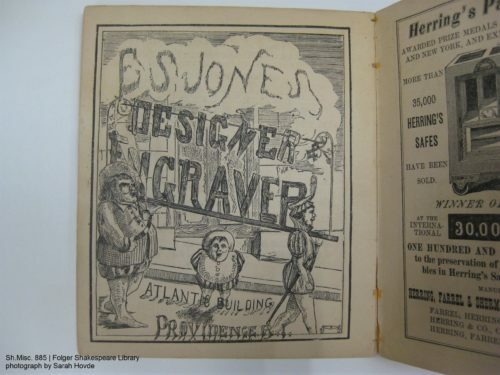 Each volume contains advertisements for different businesses and a different but overlapping set of Jones’ cartoons, meant to draw the unsuspecting reader in with their “higher class of humor,” as the publisher explains in his foreword. Want to learn more about the Shakespearian advertiser? Brown University’s John Hay Library owns the original printing blocks! They were cataloged in 2012, and more information is available in their finding aid. And if you’re searching the Folger catalog, you can now find not just one or two, but three books illustrated by Edward S. Jones. Perseverance coupled with a bit of serendipitous luck pays off! Back in the 1990’s, or thereabouts, a remainder quantity of these – all in Fine condition – turned up in the book trade. I remember buying several copies at the time, at very reasonable prices, and selling them all too quickly. Today, it’s a preciously scarce, odd title.